The Leading Edge is an alliance that helps Jewish nonprofits find and place leaders into senior positions. 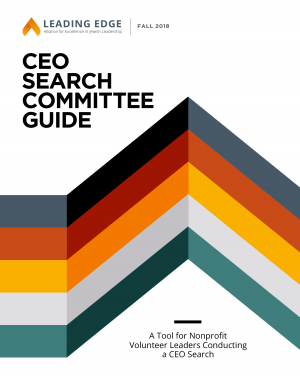 They have partnered with Harvard Business Review to develop the CEO Search Committee Guide, a tool that lays out best CEO search practices for nonprofit volunteer leaders. I am a member of the board for a nonprofit organization in Ridgecrest, CA. I have been appointed to be a member of a CEO search commitee and would like to request a copy of the “CEO SEARCH COMMITTEE GUIDE”. Thank you in advance for your help. If you click the link above ” View Resource” you should be able to find a link to two different reports. Once you’re there click the “Download Here” button and it will prompt you to enter your name and email address. Once you do that, the report should begin to download.